Ocean Ridge Plantation is a stunning, residential golf and beach community in coastal southeastern North Carolina. The Ocean Ridge developer and the property owner’s association (ORMA) have made progress in the ongoing lawsuit. Ocean Ridge Plantation features elegantly designed homes, championship-level golf courses, and world-class amenities. 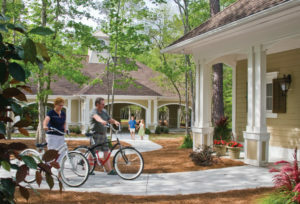 The award-winning community offers the perfect atmosphere for living the ultimate coastal lifestyle. When the Ocean Ridge Master Association—the property owners’ association for Ocean Ridge Plantation—turned over its governance to board members who were elected by property owners, there was an overlooked exemption provision that led to Ocean Ridge developer Mark Saunders being overbilled by hundreds of thousands of dollars. The protective covenants called for the developer to be exempt from property assessments beginning at the time of the turnover. Unfortunately, the exemption provision was apparently overlooked, and developer companies managed by Mark Saunders continued to be billed and paid for assessments on home sites they owned. In order to correct the issue and avoid a statute of limitation defense the Ocean Ridge developer filed a lawsuit in the Superior Court of Brunswick County, NC. The lawsuit is expected to be resolved shortly. North Carolina lawyer Mark Hamlet has been selected by both parties – the Ocean Ridge developer and ORMA– as the mediator for the lawsuit. The mediation is set to take place in May 2018, unless the parties come to an agreement before that time. “We look forward to resolving this issue fairly and equitably,” Ocean Ridge developer Mark Saunders said. Mark Hamlet is certified by the North Carolina Dispute Resolution Commission as a mediator for North Carolina court mediations, and a member of the New Hanover County and NC Bar Associations. He formed his firm, Hamlet & Associates, PLLC, out of Wilmington, NC, in May 2012. If you’d like to learn more about the amazing homes, world-class golf, and incredible amenities at Ocean Ridge Plantation, visit www.oceanridge.com for more information on this coastal community.